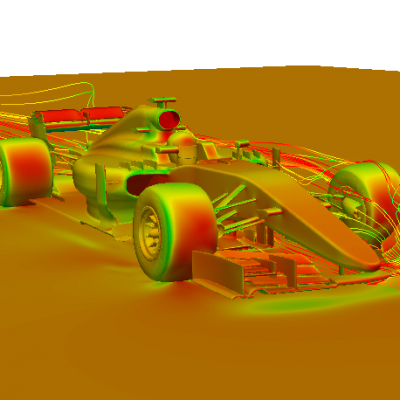 In this course you will learn how to use OpenFOAM CFD for external aerodynamics, typically for race car and vehicle analysis. The course steps you through from start to finish what steps are involved, what to do in the software and you will be able to follow along and experiment with the various settings in the provided tutorials. By the time you get to the end of this course, you will be able to run your own CFD simulations for your own geometries (or geometries that you can access online or through 3d Scanning etc). We highly recommend that you take the Introduction to CFD course prior to this as it will help you to understand what the settings relate to, how your solution accuracy is affected and how to minimise your solve time to increase productivity. You’ll get an overview of the CFD process and the best practices to ensure valid results. This is a must for FSAE and Formula Student entrants who are using or planning on using OpenFOAM CFD. The old adage, garbage in = garbage out definitely applies to CFD, so make sure you understand what you are doing and what effect it is having on your development. This course is designed for students and professionals with an interest in working in motorsport or in fact any engineering field as CFD is now a prevalent tool in many industries. Over your time as an engineer this knowledge will be invaluable in helping you understand how CFD can be used to benefit product development and provide quick problem diagnosis. Details of the software that we’ll be using in this course. This is a HUGE section – Details to be added shortly. Some ideas for testing and understanding the software, additional courses that will help you get the most from your vehicle. Putting this into action in your own projects!